The Alpha Lambda Alumni Association of Pi Kappa Alpha is the official alumni group for the the Georgetown Pikes. The Alumni Association meets annually during Homecoming at Georgetown College and hosts several events throughout the year. - To maintain and promote true and lasting friendship amongst the brothers of Pi Kappa Alpha. - To further the interests of Pi Kappa Alpha in the community and the individual lives of its members. - To support the Georgetown College Chapter of Pi Kappa Alpha (Alpha Lambda) and its members. - To motivate and foster a spirit of pride, loyalty, inclusion and respect for Pi Kappa Alpha and its rich history. For more information or to get involved please Contact Us or check out our Alumni Association on Facebook. Photo: The Alpha Lambda Alumni Association of Pi Kappa Alpha received a William R. Nester Outstanding Alumni Association Award. The award is presented annually to the fraternity's top Alumni Associations. 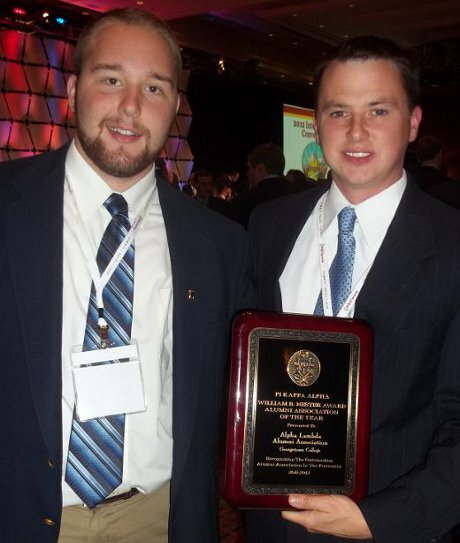 Shown are the Jacob Snider (Chapter President) and Travis T. Burton (Alumni President) with the award.